If you are a Jio user then you need to recharge Rs.99 for prime member. If you recharge Rs.99 for one time under 1st march to 31st march then you get double data for every plan recharge since 31st march, 2018. So if you one time pay for ''Prime'' membership and get one year double benefit. 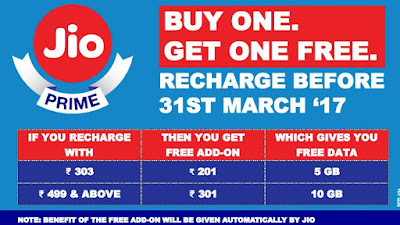 So friends if you are a Jio customer you must recharge Rs.99 and get double & double plus dhamaka benefit. When you are a ''Jio Prime'' member then you can get benefit for every recharge till 31st march, 2018 (means one year). These all booster data plans for you. If you have run out of data in the middle of the month, you can take a data add on to continue using uninterrupted high speed internet. Buy one get one free offers : If you recharge with Rs.303 you can get 5GB extra data and recharge with Rs.499 you can get 10GB extra data. It is not a confirm by jio but Airtel & Vodafone give this type of offer then jio give you more.